I was pretty lazy the first half of Tuesday. I did do the exercises that the physical therapist gave me to help with my knee, so it wasn’t completely wasted. I left for the game at 3:45 and was parked in the Brewers 2 parking lot an hour later. I went up to the will call window and dropped off the tickets that some twitter followers would be picking up. My friend wound up not being able to join me but I was able to find someone to sit with me in section 109, and someone willing to donate $60 for my two season tickets. I walked back to the general lots to hand out cards and spread my message, and it was well received by everyone I talked to. Some are more friendly than others, but I don’t know how I would react if a stranger came up to my tailgate and started talking my ear off about something I wasn’t familiar with. It got really windy around six o’clock and I figured that was a good sign to head inside. I had to make a pit stop at my car to pick my stuff up but I was inside and in section 207 by 6:20. 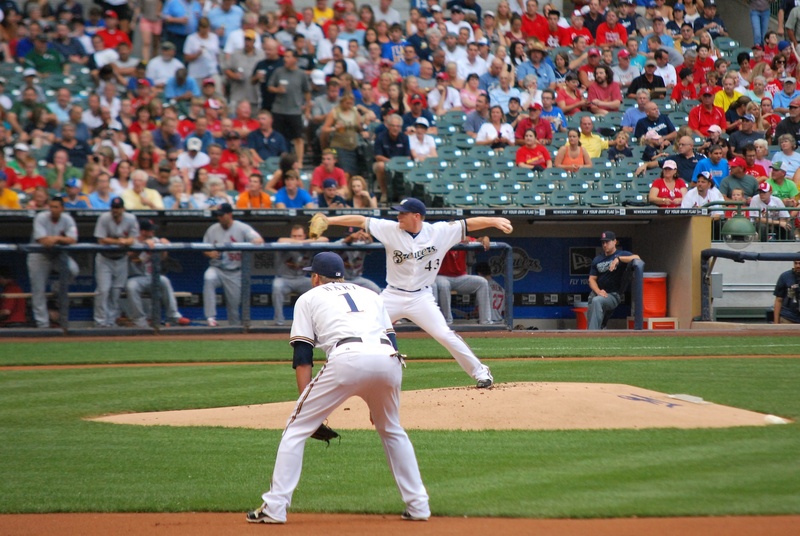 I had a nearby Brewers fan (Chris) take game photo number 90 for me. It took Chris one try to get a picture I was cool with. Thanks Chris! Only 72 games left; the season is flying by. 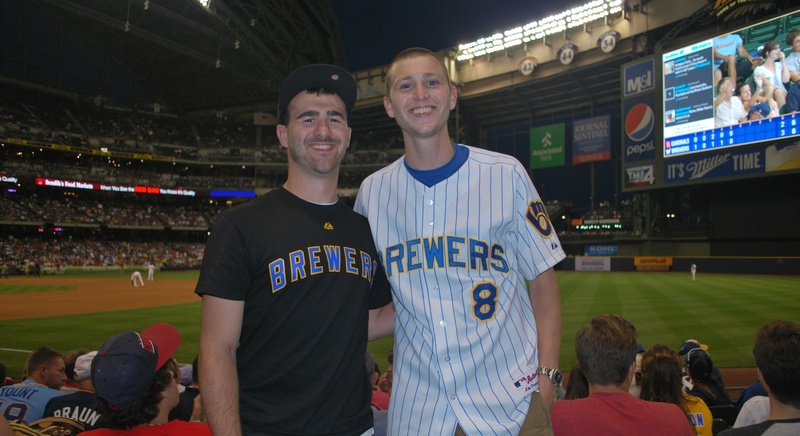 When I got inside Miller Park I got a text from an unfamiliar number, saying it was Drew from FS-Wisconsin, and that they wanted me to do an interview during the game. I said yes (of course), and agreed to meet in the first base side camera well after the third inning. To kill some time before the game started I sat in a barstool above the right field loge bleachers, next to the sliding panels that were open. There was a nice breeze blowing in and it’s a great spot to get some fresh air if you’re ever in need of some at Miller Park (and the panels are open). I went to my season seat location and said Hi to Scott and his girlfriend. Scott joined me for the game on June 29th, and he agreed to pay $60 in a Be The Match donation for my two seats since I was sitting elsewhere. Thanks Scott! After chatting for a bit I headed down to my seats for Tuesday’s which were in section 109. Jeff, who sat with me in the Doorman’s seats on May 22nd, gave me his two tickets for this game. I didn’t have someone to go with, but Matt, a twitter follower, agreed to make a donation and sit with me for a game. Thanks Matt! And thanks Jeff for donating your tickets! In the bottom of the first the Brewers put two guys on with no outs, but Braun struck out and Ramirez grounded into a fielder’s choice. Corey Hart bailed his teammates out with a single to left field and the Brewers took a 1-0 lead. 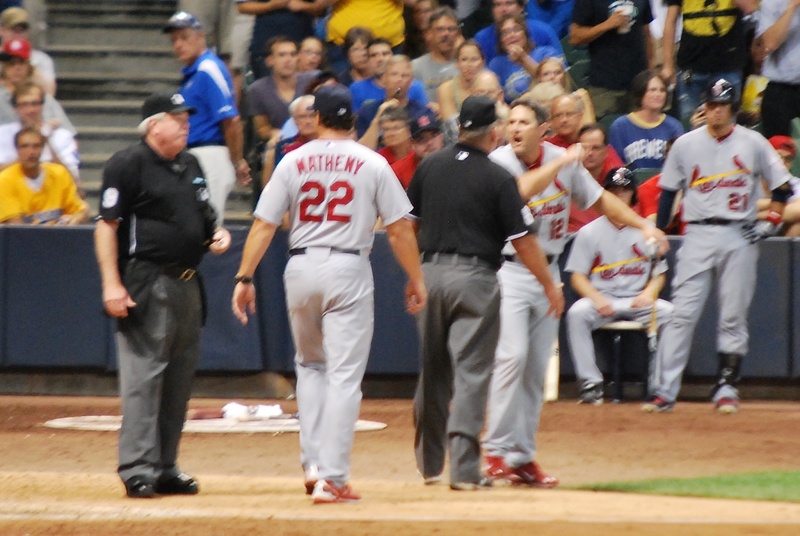 In the top of the third the Cardinals scored twice but the Brewers answered in the bottom of the third. Aoki walked and was replaced at first when Gomez grounded into a fielder’s choice. Braun grounded out, but during his at bat Gomez was able to move to second on a failed pickoff attempt by the Cardinal’s pitcher. Ramirez got the job done with a single to center, and the game was tied. When FS-Wisconsin came back from commercial for the bottom of the fourth the camera on the left turned around and was used for the interview. Drew asked about the journey so far and we mentioned the Be The Match aspect. I don’t have the video yet but I should be able to include it in the post for Wednesday’s game. 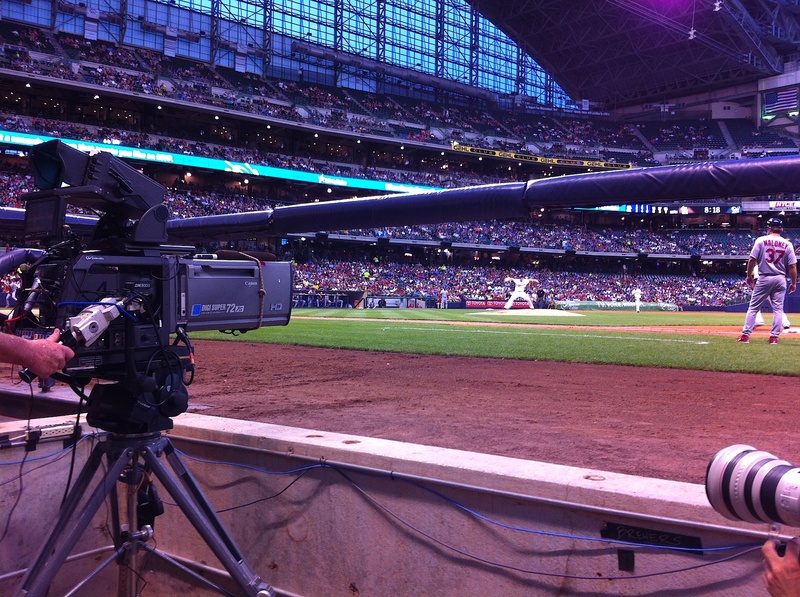 As my interview was ending Rickie Weeks hit a bomb to left centerfield and it gave the Brewers a 3-2 lead. I mentioned my twitter handle during the interview and when I got off air my phone was buzzing non-stop for the next 15 minutes. I can’t find where to turn off notifications every time you get a follower on the echofon twitter app. My followers jumped from 830 before the interview to 975 within 20 minutes or so. As I type this at 1:08 AM I’m currently at 1,060 followers. A lot of tweets came my way with people voicing their support and I greatly appreciate it. Moments like that keep me going and reassure me that I made the right decision in taking on this challenge. Between the 5th and 6th innings I had a fan two rows behind us take a picture of Matt and me. Matt is on the left, I’m on the right. Matt lived in Ohio until the late 90’s so he’s a a Buckeyes fan. I saw this on his twitter page and STILL allowed him to join me at the game. I graduated from UW-Madison so for me it’s the Badgers all the way. In the sixth I took a zoomed out picture of what it looked like from our seats in section 109, row 7. It was somewhat challenging to not get distracted because right in front of you was the outfield, and not the infield. From my seats in 221 I have the luxury of just looking straight ahead and seeing the action. I missed four pitches during the interview but didn’t miss any in my seat; yay. 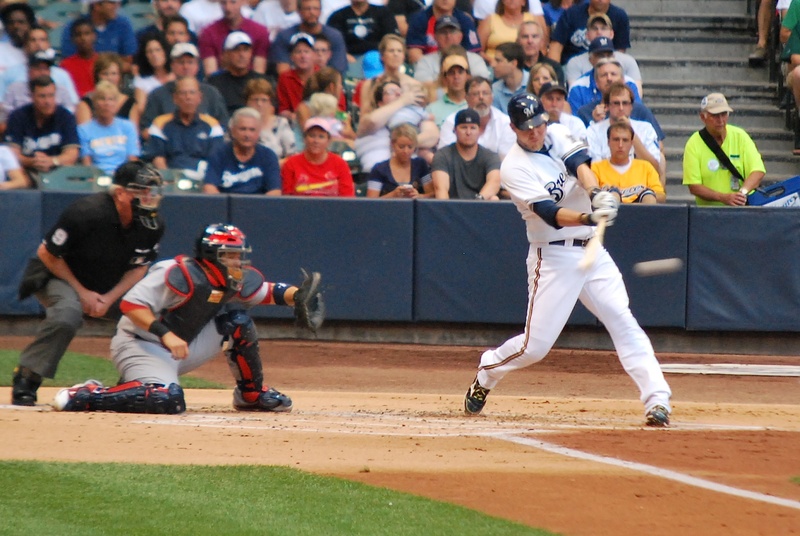 In the seventh inning pinch-hitter Lance Berkman struck out swinging with runners on first and second. He wasn’t too happy with the two called strikes during his at bat and during the middle of the seventh he came back out to have a word with home plate umpire Brian Gorman. Berkman was ejected but it didn’t have any consequences since he was used as a pinch hitter and wouldn’t have been able to re-enter the game anyways. The photo isn’t the best, but you get the *picture. Ha! Manny Parra pitched a scoreless 8th inning and newly designated closer Francisco Rodriguez (K-Rod) came on in the ninth for the save. He gave up back-to-back hits to open the inning and I’m pretty sure everyone in the building was thinking the same thing: “here we go again.” The balls weren’t hit that hard, so I can’t get too upset. He didn’t allow the base runners via the walk so that’s a good sign. With the infield in K-Rod induced a groundout, struck out the next batter, and then got Daniel Descalso to pop out to the shortstop. The Brewers win, the Brewers win! Whew! 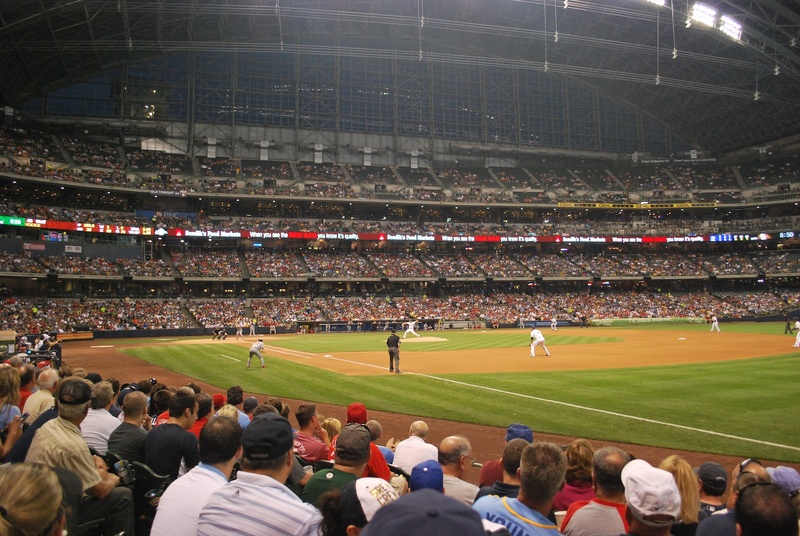 Final Score: Brewers 3 – Cardinals 2. I just referenced a run expectancy matrix, and with runners on first and third with nobody out teams scored at least one run 86.8% of the time (using stats from 1993-2010), and the run expectancy of that situation was 1.853 runs. Double Whew! 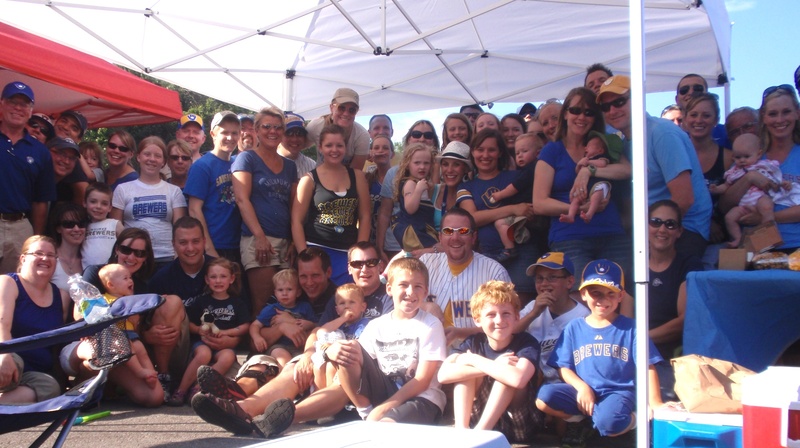 On Saturday I joined the King of Brewer Events tailgate with Victoria (my girlfriend) and her parents. It’s put on by the family of one of Victoria’s friends, some of them have the last name of King, thus the title. You should check out the post because there was some delicious food including a “Sausage Race on a Stick.” Someone took a self timed group photo and I didn’t have it in time for that post. I count 56 people and I know there are at least two who aren’t pictured. It was a great time. Thanks again for inviting us. Saw your interview last night. Great job! I wondered if you were able to see the pitches during the interview–I was almost a little distracted watching the interview wondering if it was causing your pitch streak to end. I read the blog daily via my Google Reader subscription. 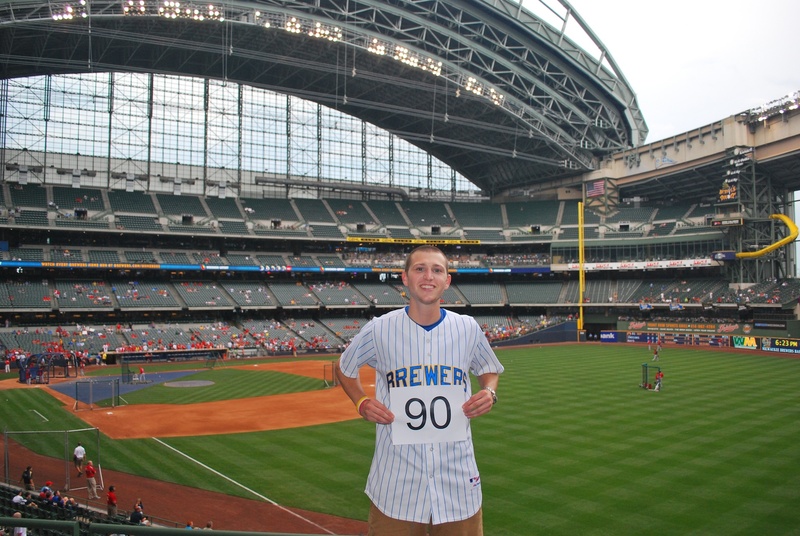 It has been a great way not only to learn about Be the Match, but to keep up with the Brewers. My son turns 18 in August and we are going to join the registry together when he does. Best wishes as the season continues and also in getting back to “real life” after the season. I have a feeling that if you continue the blog for a while after the season, it will still be interesting reading about how you adjust to not going to a game every day.